Toby is encouraging Sky to act like a rotten kid when she's out with Eric, but Joe says it'll just make him look like a bad father, and it could go against him in court. Matt helps Joe to clear up while he worries that Eric is taking Sky to the zoo - what if she gets upset? Bouncer is looking a bit glum. Dorothy is telling Pam and Doug the 7pm start time for the Neighbourhood Watch meeting - they have "serious security issues" to discuss. 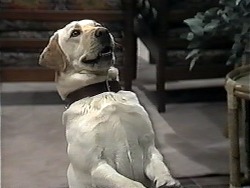 As she's leaving, Bouncer arrives, carrying his lead, and begs Dorothy to take him for a walk. She says she hasn't got time just now, but relents and says he can come with her to the shops. Helen is very curious about meeting Cynthia and tells Jim so, but as she's talking, the doorbell rings. Helen quickly checks her makeup and hair while Jim answers the door. 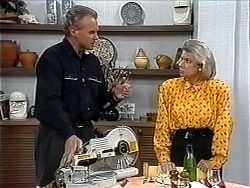 He comes back and introduces Cynthia to Helen - she's a circular saw! JIM: Yes, I know what you thought. Maybe this will teach you to stop interfering in my private life. I do *not* need a matchmaker. Helen is not impressed, but Jim says that Cynthia is going to help him to develop an idea he's had in his head for some time now. JIM: So, is it alright if she moves in? 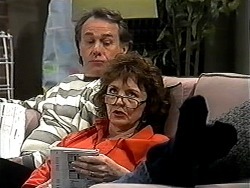 Gemma and Ryan are doing homework on the kitchen table while Madge speaks to Tom on the phone. She reminds Gemma how important it is to pass her exams and doesn't want her to go out during the week anymore - she can see Matt on weekends. Gemma is not impressed, but Ryan says it's better than living with the school principal! 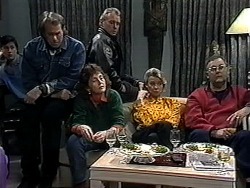 Harold decides to go and give Joe some moral support over the Eric access visit, while Helen comes in through the back door and tells Madge about Cynthia being a prank - and she made a roast dinner too! Madge laughs and finally Helen starts to laugh too! Joe is brushing Sky's hair while Harold intones how wrong it is that Sky should go to a total stranger. There's a knock at the door and Joe answers it to Eric, who he invites in. He introduces Eric to Harold and Matt, then Eric picks Sky up. ERIC: I'll have her back in a couple of hours. JOE: Yeah. Now remember she's a vegetarian, eh? That's the way Kerry brought her up and that's fine by me. And only one ice- cream! Joe gives Sky her teddy and then Eric and Sky head off. Joe looks gutted. Gemma and Ryan are doing maths homework and struggling a bit. Matt comes in and Ryan decides to call it a night. 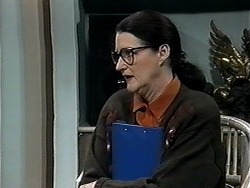 Madge tells Matt that he should leave too - Gemma has to study. Gemma is not impressed. Matt says he'll sit quietly and read the paper until Gemma has finished. Joe and Harold are having a cup of tea. Joe is being a bit paranoid that Sky will like Eric more than him - he'd prefer it if Sky didn't like him, and then maybe Eric would leave them alone. Toby comes in and says he can't find Bouncer. Harold points out to Joe that he is Sky's father and noone will change that. 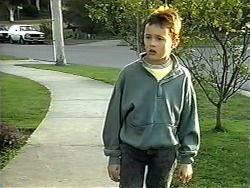 Toby is looking for Bouncer and catches sight of him going into Dorothy's house with her. Toby knocks on the door and demands Bouncer back. Dorothy explains that she took him to the shops for a walk. Toby is very cross and is even crosser when Bouncer is reluctant to leave Dorothy. He drags Bouncer off. Pam is doing the crossword and asks Doug for a four letter word meaning trouble. He replies C- O- D- Y! Doug is trying to get out of coming to the Neighbourhood Watch meeting and Pam is not impressed. Doug says he refuses to get involved, and if he goes, Dorothy will give him no choice. Pam is forced to tickle him into submission! Matt is moaning that there is no work around and he's fed up of looking. 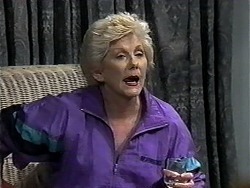 Madge says there might be some openings at the Waterhole on weeknights - she'll look into it. Gemma finally finished studying and looks at Madge suspiciously - she reckons Madge is trying to keep Matt busy during the week so she'll have less distractions from studying! Eric is a bit late back with Sky and Joe is beside himself. But just then Eric and Sky arrive. Sky has a balloon and appears to have had a good time. Eric explains that he took Sky to the zoo alone - his wife was called away on business, but they had a great time together. Dorothy calls the Neighbourhood Watch meeting to order - participants are Doug, Pam, Jim, Helen, Madge, Ryan and Harold. She talks about the prowler and how they need to report any suspicious activity in the street to the police. She wants someone to volunteer to liaise with the police and Jim very reluctantly does so, since he knows the sergeant already. Joe is upset that Sky liked Eric. Gemma tells him not to worry. Toby is moaning about Bouncer hanging out with Dorothy. Matt explains that Dorothy helped out with Bouncer while they were away and they've bonded. Dorothy is on to street- lighting now and refuses Doug permission to go to the toilet(!) 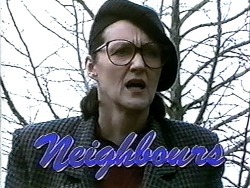 She asks Madge to asks the council about improving street lights. She says if someone writes a report she can put it through the proper channels. Then she assigns Doug to check everyone's windows and doors. He rolls his eyes. Pam is volunteered to write letters to the council. Bouncer is ignoring Toby, but gets up and runs to Dorothy when he sees her. TOBY: Get your hands off my dog! 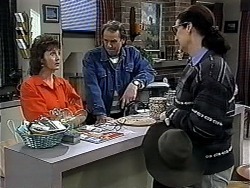 Dorothy tries to get Bouncer to go back to Toby, but he doesn't want to. 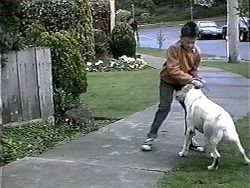 Toby drags Bouncer off. TOBY:(upset) Leave him alone! Leave him alone!